Music Bingo is a fun way to help learn reading music. You play exactly like normal bingo, except each of the squares contains musical notes. 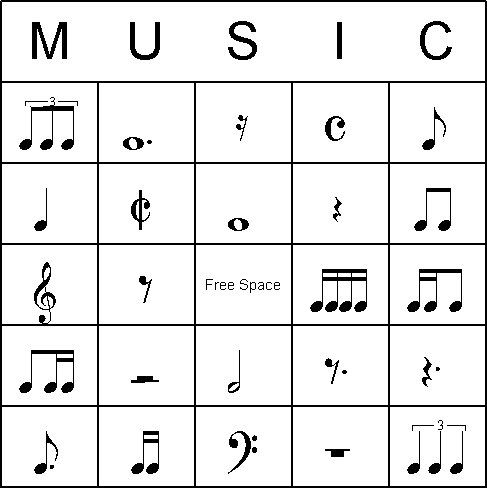 Below is a printable set of music bingo cards (click the Print icon in the window to print). Just print and play! Instructions for producing your own custom music bingo cards are below. Before you can start, you need to install a music symbol font on your computer. This step can be a little bit involved, so if you are a relative computer novice, you might want to get some help from somebody with a bit more experience. At the time I created it, I used a font from this web page - http://www.icogitate.com/~ergosum/fonts/music-fonts2.htm - but unfortunately that page no longer seems to be working. Once you have found a suitable font, you need to download and install it. If you are not sure how to do this, check with the font supplier (there may be instructions on the website), or get help from a more experienced computer user. Download Bingo Card Printer software, and follow the instructions for installing the program on your computer. You will need to Register your copy of Bingo Card Printer, so click Register... in the Options menu and follow the instructions. Click Fonts... on the Format menu. A dialog box appears: select MusiSync as the Squares Font, then click OK.
You now need to type-in your music notes into the field on the screen labelled Type your new item here and press Return/Enter on the keyboard after each one. A somewhat clumsy way to do it is to type in any one upper or lower case letter, and see what comes up in the preview. If you don't like an item, you can always delete it from the left-hand list, by selecting it with the mouse and choosing Delete Item on the Edit menu. Another way to do it is to use the Character Map application that comes with Windows. You find this under Start then Accessories then System Tools. Set the Font drop down to MusiSync. You can move characters into the Characters to copy field by double clicking them, you can copy from there to the clipboard using Copy, and you can paste them into the Type your new item here field in Bingo Card Printer by clicking on it then pressing Ctrl+V on the keyboard. Note: You will need to add at least 24 items, but you can add more if you want. You should uncheck Print Call List on the main screen, as your boss is going to be doing the calling for you!